If you want to open a file named foo, run c9 open path/to/foo. If the Console pane at the bottom is visible, you should be able to open a new terminal tab by clicking the plus button atop that pane, and choosing New Terminal. TIP: If you no longer see the Console pane, you can bring it back via View > Console or by hitting F6. You can also open a terminal in any other pane. Sure, if you are more familiar, you can run editors in the terminal such as emacs, nano, or vim. 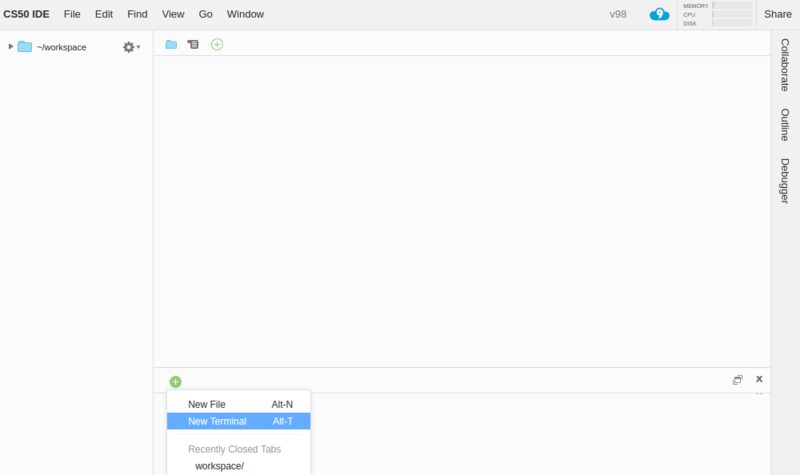 Choose File > Download Project to download ide50.zip, an archived file (in .zip format) of your workspace files. You can use your existing Cloud9 account to create a CS50 IDE workspace by clicking this link, which will bring up a Create a workspace page with the default settings already selected. NOTE: Be sure to check Private, under Hosted Workspace, if not checked. All you’ll need to do is create it! You can then access CS50 IDE from your Cloud9 dashboard, like you would access any other workspace. Yes, this is totally normal. If curious, ~/workspace/.c9/ is used by Cloud9 IDE (and CS50 IDE) to hold some workspace settings, your undo history, and other metadata. Generally, you shouldn’t touch this folder or its contents. Files and folders whose names start with a dot (aka dot files) should be hidden by default. You may want to hide the .c9 folder (along with any other dot files) by clicking the gear icon atop the file browser on the left and unchecking Show Hidden Files. Back up your files per What’s the best way to back up my work?. From CS50 IDE > Dashboard click on ide50. Click on the gear icon next to clone on the top-right corner. Alternatively, you may visit https://cs50.io/<your-username>/ide50/settings where <your-username> is your CS50 IDE username. Your CS50 IDE username should be part of the URL of your workspace, or you may run username50 in a CS50 IDE terminal tab to get it. If you are sure you have backed up your files, scroll down to the bottom of the page and click Delete workspace. In the text field type ide50 and click Confirm. Go to cs50.io and log in as usual. This should automatically create a new 5GB workspace for you. You can confirm by clicking stats button on the top-right corner and checking the disk space. Please follow the instructions per How to restore my work after backing it up? to upload your files to your new workspace. Let sysadmins@cs50.harvard.edu know if you need further assistance! Go to https://github.com/check50/<your-username>/invitations and https://github.com/submit50/<your-username>/invitations, after replacing <your-username> with your actual GitHub username, and click Accept invitation, then try check50 and/or submit50 again. Let sysadmins@cs50.harvard.edu know if you need further assistance! If curious why this happens, earlier the Authorize Application step was sufficient for adding your GitHub user as a collaborator with write access on your check50 and submit50 repositories that we automatically create for you, but GitHub updated their API recently to require users to accept invitations for repositories they’re added to, so the Authorize Application step isn’t sufficient any more, and you have to accept these invitations. From Cloud9 > Go To Your Dashboard click on ide50. Click on the gear icon next to clone on the top-right corner. Alternatively, you may visit https://cs50.io/<your-username>/ide50/settings where <your-username> is your CS50 IDE username. Your CS50 IDE username should be part of the URL. If you’re presented with the Create a new workspace page, be sure to click Private under Hosted workspace, and to select Harvard’s CS50 under Choose a template. Follow the instructions per How to restore my work after backing it up? to upload your files to your new workspace. Let sysadmins@cs50.harvard.edu know if you need further assistance! Please follow the instructions at How do I recover a deleted file?. Let sysadmins@cs50.harvard.edu know if you need further assistance!